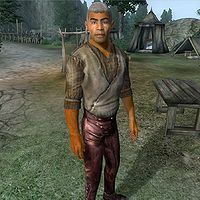 Boldon, a Redguard commoner, is one of the refugees of Kvatch. He can be found in the encampment located along both sides of the road to Kvatch. Still in a state of shock after having witnessed the destruction of his home town, Boldon is unable to sleep or eat and just wanders restlessly around the refugee camp all day and night, at times scouting towards the Gold Road for other survivors. His wardrobe is all he owns and consists of typical lower-class items: a coarse linen shirt with laced leather pants and rough leather shoes. He also carries a small amount of gold. When you speak to him for the first time, he will only ask: "What do you want?" Should you ask him about the attack, he will recall the events and tell you what he knows: "Late at night, while we were all asleep, a door to Oblivion opened. Daedra came out and set fire to the town. Many people died, but some got out alive." Once you have closed the Kvatch oblivion gate he will be grateful: "You're the one who closed the gate? Thank you." Boldon may appear next to you after being released from prison. After spawning, he will immediately head for Kvatch. This bug is fixed by version 1.0.0 of the Unofficial Oblivion Patch. This page was last modified on 25 March 2018, at 02:43.